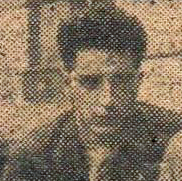 Cyril is highlighted in this 1939 photo of the Dublin Brigade Council (Dublin Brigade Review). Every man at the Custom House on 25 May 1921 had his own unique journey to that event. They came from many parts and different backgrounds. But Cyril Daly stands out for a couple of reasons: he was born in England, the son of a doctor; and he had attended the prestigious Westminster Cathedral Choir School. It would be fascinating to know what influenced him to join the IRA which landed him in Kilmainham Gaol after his arrest at the Burning. That is one of a number of gaps in this writer’s knowledge about the man’s life but hopefully that won’t spoil his story which is still well worth telling. Vicinity of Cyril Daly’s original home which the writer believes is on the right, facing the line of trees. Cyril James was born late 1897 in Eastbourne, a seaside resort town on the coast of Sussex in south east England. His father William John Daly was a doctor originally from Glenties, Co Donegal. In 1894 Dr Daly had married Susan Grace Mercer, 12 years his junior who came from the Liverpool area. From all appearances, their record in the 1901 census at Victoria Place, Eastbourne suggests the Dalys were financially comfortable. The family of 6 had three servants and lived in a substantial house. Another view of Cyril’s birthplace, Eastbourne (from flickr.com). Ten years later that picture had changed dramatically. The family was split up and scattered. The father was still a practising doctor living at Gildridge Road in Eastbourne. He recorded himself as married with 6 children, all still living. There is no trace of his wife (known as Grace), either living or dead. Three daughters are living as adopted children in another house – with 12 rooms – on South Street, Eastbourne. The owner and their adoptive mother was a young Scottish married woman of independent means with a team of servants and nurses and a great name – Alice Tempest Stone. And the same census shows Cyril, aged 13, with his brother Hugh (a year older) as a boarder in Choir House, next to the Catholic Cathedral in Westminster, London SW1. Choir School, Westminster where the Daly brothers were boarding pupils. Since that school was fee-paying, clearly their father seems to have had money, despite the apparent disintegration of his family. No criticism intended, who knows what the situation actually was. It appears his children were well provided for, financially in any event. The school was well regarded and provided a high standard of education for its day-pupils as well as the relatively small number of boarders who were destined to progress to senior schools elsewhere. One of the duties of a boarding pupil was to sing at daily Mass in the Cathedral, a tradition still carried on today. Boarders in 1935. Their formal uniforms probably hadn’t changed since the Dalys’ time there. The place seems to have been a bit posh (from: http://www.choirschool.com/). Dr William Daly died in 1915. His younger children apparently stayed in England and seem to have done well in life (one daughter much later became a magistrate in Plymouth). But the two brothers Cyril and Hugh surfaced in Dublin. Their reason for coming here is not known. Possibly they had relations in the city; or maybe they were avoiding WWI conscription in Britain? The records of his arrest and detention in Kilmainham after the Burning of the Custom House. Daly’s name on the scarily accurate British list for suspects to be arrested in raids, late 1920. Only three months before the Custom House job Cyril had married a farmer’s daughter named Josephine Hunt while both of them resided at 96 North Strand, Dublin City. The marriage cert records him as a chemist’s assistant; and his brother Hugh as best man. The couple moved to nearby Leinster Avenue, the address on Cyril’s arrest report when he also gave his correct occupation. Like almost all the other Custom House men taken prisoner Daly was jailed in Kilmainham and held without trial until release in December 1921. Unfortunately we don’t know if he ever used his choir singing skills with his Kilmainham comrades either at Mass or during recreation seisiúns held as prison conditions relaxed to some degree during their captivity. There are two previously published photos taken of Daly in the Gaol. Cyril is 2nd from right in back row. Taken from ‘Revolution in Dublin’ by Liz Gillis. 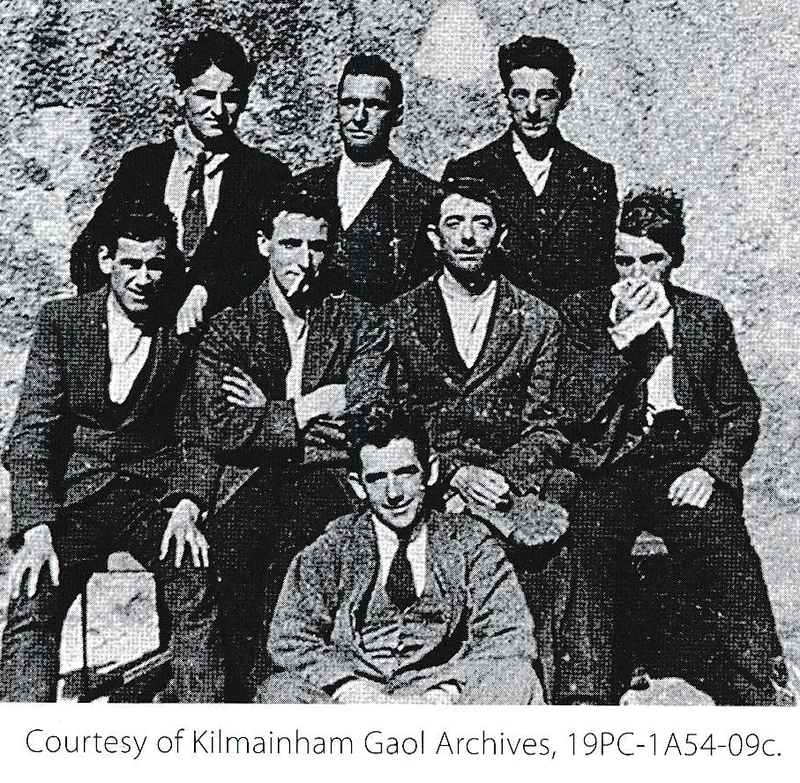 In this Kilmainham image, Cyril is 2nd from left (with arms folded) in the middle row. Again from the Liz Gillis book mentioned above. However, we are delighted to now show two previously unseen photos of Cyril Daly in Kilmainham. 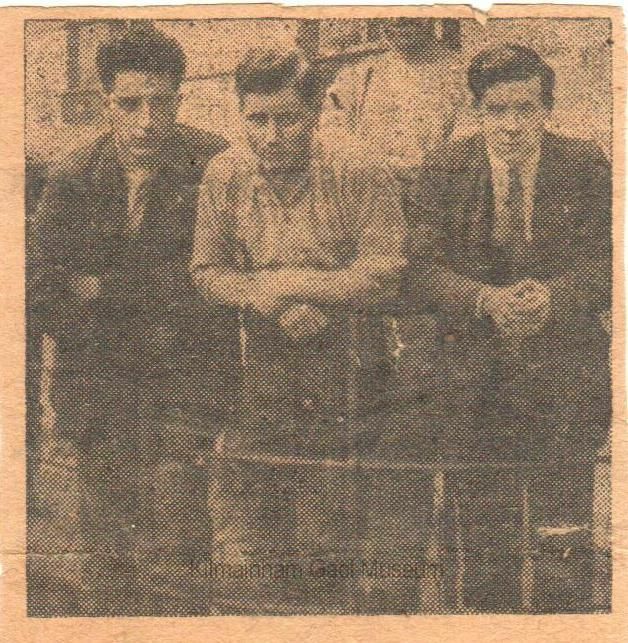 L-R: Cyril with Frank Bolster & Christopher Fitzsimons – © Kilmainham Gaol Archives, Ref. 19PC-1A54-10, courtesy of Gary Deering. 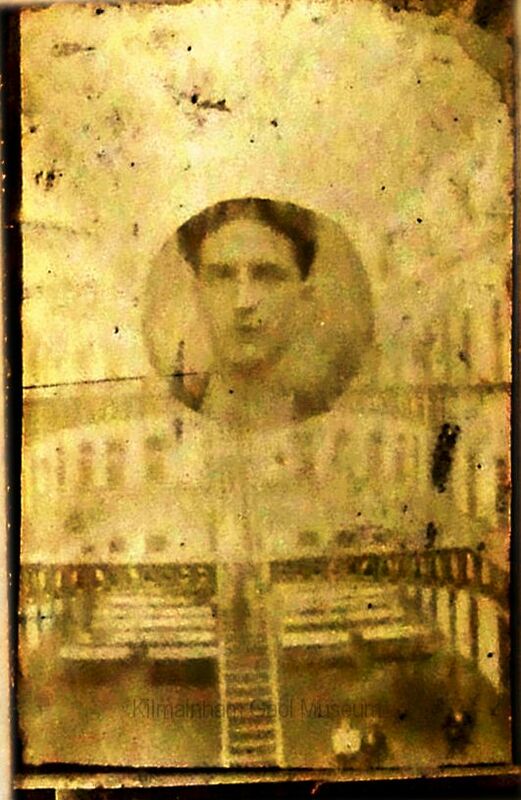 Portrait of Cyril on background of Gaol interior – © Kilmainham Gaol Archives Ref. 2010.0123, again courtesy of Gary. There is nothing to show that Cyril Daly was actively involved in the Civil War, but in its closing stages he joined the National Army. On 11 March 1923 he was commissioned as a Lieutenant and served as an assistant in the medical stores, Army Medical Service at HQ in Parkgate Street, Dublin. He was then posted to the role of Chemist in the Curragh Camp until 1931 and, after promotion to Captain in 1934 went on to serve with the No. 1 or No. 2 Hospital Coy to 1939. Daly spent the rest of his military career as Officer-in-charge at the Base Medical Stores Depot, Army Medical Service. In 1942 he became an Acting Commandant before his voluntary resignation on 30 January 1947 (His older bother Hugh also served in the Army and was recorded as a doctor at Portobello Barracks on his marriage cert in September 1922). When the Old IRA membership lists were assembled in the mid-1930’s, Cyril was listed in F Coy on both critical dates (11 July 1921, when he was in Kilmainham; and 1 July 1922). He then lived at 14 Prince Edward Terrace, Carysfort Avenue, Blackrock, south Co Dublin – an ‘up-market’ address judging by current asking prices for houses there! Prince Edward Terrace in Blackrock. Cyril’s former house is the one on left. However, Daly never forget his old IRA comrades. He had supplied references for several former IRA men in military pension applications in the 1920’s. We have seen him in the 1939 photo and he was also actively involved in the Custom House Memorial Committee. He attended the funerals of many of the Custom House Men as, one-by-one, they passed away. For example “Capt. C. Daly and Capt. W. (‘Bill’) Donegan” (another Custom House man) are listed at the funeral of old Company comrade Richard Seville at Glasnevin Cemetery in 1955. Seventeen years later Cyril himself passed away, aged 74. His family death notice described him as ‘Retired Army Officer, A.M.S.’. Cyril James Daly was buried in Deansgrange Cemetery on the south side of Dublin. He was survived by his widow, children, brother Hugh and two nephews, sons of Hugh. Possibly reflecting Irish social conventions (or snobbery?) of a time not so long ago, the only relatives named are two doctors and a priest; while his immediate family are strangely anonymous. Ireland has definitely changed in many ways since then – for better or worse we leave to the Kind Reader’s opinion. So ended life’s journey for the Sussex lad, former chorister at Westminster Cathedral and IRA Volunteer. He had travelled a long way to fight against the country of his own birth for the independence of his father’s native land, where he became a family man and career Army officer in a medical capacity.